This house has survived over 400 years and still looks great! 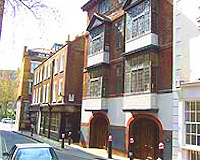 Description: This remarkable reisdence in the City of London is the only residential survivor of the development of the ground of St. Bartholomew-the-Great, initiated by Robert, third Baron Rich, in 1583. The house stands on the part of this early development known as the Square in Launders Green. This block is described in the survey of 1616 as containing eleven houses with a court in the middle. Of these eleven houses only the property known as 41 and 42 Cloth Fair survives; the original structure much unchanged since its first lease of occupation of 1614 with the pre-Elizabethan well walled in on the north east corner of its basement. By 1929 all other Elizabethan and Jacobean properties had been demolished by the City Corporation as part of their sanitary scheme. This property was also to be demolished having received a dangerous structure notice, but luckily it was saved, made secure and lovingly restored by John Seely and Paul Paget to become their residence and architectural studio. They owned the property from 1930 to 1978. In 1979 the property was sold and converted into offices and became much neglected and in need of further considerable repairs and renovation. In 1995 it was purchased by the current owners and extensive restoration and repairs took place to the property. The rear half-timber wall which the Royal Commission of Historic Monuments reckoned to be earlier than 1614 and has been put at circa 1597/98 was discovered and restored. All the works were authorized and supervised by the Royal Commission of Historic Monuments, English Heritage and the City of London Corporation. The property has now been restored to a beautiful home which received the City Heritage Award in 2000 as the finest example of building refurbishment contributing to the enhancement of the environment of the City of London. The Grade II listed home has been featured in many books, publications and guides. It has plenty of entertaining space as well as six bedrooms, two terraces and a garage over 6,110 square feet and one of the most beguiling kitchens I have seen in a while. The leaded windows bear the signatures of many distinguished visitors to the property, etched on with a diamond pen, including Field Marshall Montgomery, the Queen Mother to Sir Winston Churchill. There are skeletons in the foundations (rumored hauntings abound) and a stunning staircase. It was preserved from the Great Fire because it was all enclosed by the wall of the priory.